LAHORE – Najam Sethi has almost packed his suitcase and is waiting for the umpire to raise his finger so that he can swiftly vacate the office, reliable sources have informed The Dependent. 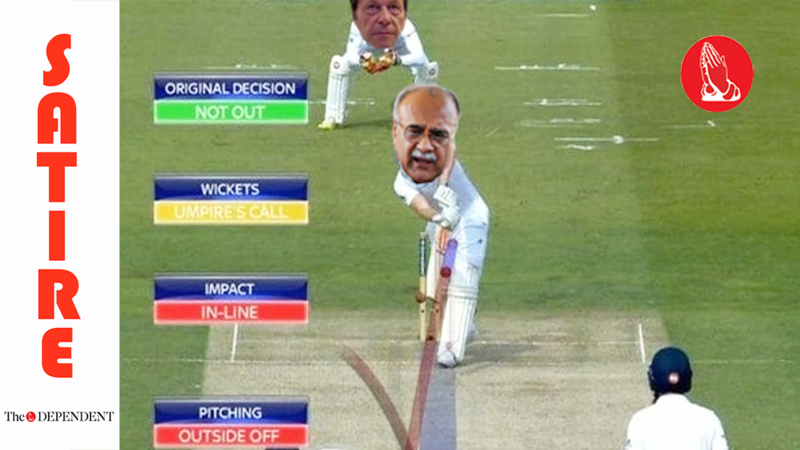 Sethi’s future is currently hanging in the balance and waiting for the umpire’s call, after the captain decided to review the decision. The ball is pitching in line and the impact is right in front of the stumps. However, it is for the third umpire to decide whether the ball is hitting the stumps in the ball tracking. According to anonymous sources that confided with The Dependent, Sethi hasn’t slept since captain’s appeal. “Sethi saab asked me to buy biscuits from the market for tea time. Upon returning with the biscuits, I told him that these were specially made cookies that had raisins… at which Sethi sab shouted at me, scolding ‘resign? What resign? Why would I resign?’” a domestic worker in his home disclosed, adding that he still doesn’t understand why saab ji reacted in such a way. Another employee at the Sethi residence confided that his boss was continuously biting his nail while watching the 9 o clock bulletin. “Saab jee watched the hour-long bulletin till the end and once it was finished, he took a deep breath,” he said. It was added that Sethi had taken his gloves off and was ready to go back to the pavilion without contesting the likely call. “After all, what option does he have? He’ll be the last person to puncture the authority from onwards” the domestic worker mocked.